Thank you for joining us this week as we conclude our series, The World’s Weirdest Insects. Last week, you learned that, while over a million insect species have been identified, there are still quite a few species lingering around out there that have yet to be discovered. Nature is full of amazing creatures – many of which are very weird (for a lack of better term). 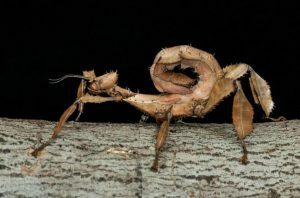 You have been briefly introduced to three of these weird organisms – the Devil’s Flower Mantis, the Scorpion Fly, and the Dasychira Pubibunda Caterpillar. This week, we will conclude this series by introducing you to three more of the weirdest insects that have been discovered in the world. When it comes to weird insects, the Puss Moth Caterpillar truly tops the charts! While this caterpillar has a very soft body, it uses the defense mechanism of mimicry in order to fend off predators. The face of this insect is quite scary. It has simple black dots for eyes and a large, gaping mouth. Inside of this mouth is where the head of the insect truly protrudes. 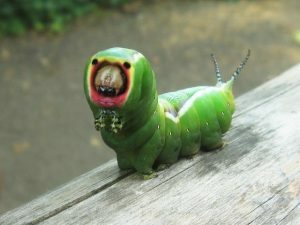 If attacked or it feels threatened, the caterpillar will turn the face toward that which it fears. If this activity fails to fend off the predator, a formic acid is ejected from the horns on the back in a mist. One look at this insect up close and you are sure to have nightmares! The Extatosoma Tiaratum is often referred to by many as the “Giant Prickly Stick Insect”. If you have seen the Temple of Doom from the Indiana Jones series, you should immediate recognize this insect monstrosity. This is currently the largest known stick-based insect known to man. It is capable of growing up to 8 inches in length. It is covered in spikes that are large and thorny. In most instances, the insect stays to itself and blends into the natural environment; however, if it starts to experience a threat, it will stand up on its hind legs and release a chemical that is designed to scare away the predator. To humans, though, the chemical that is emitted from this weird insect’s body simply smells like peanut butter. 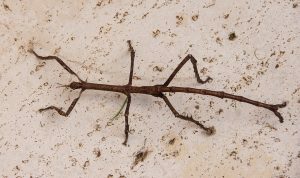 The last weird insect that we would like to cover in this series is the class Giant Stick Insect. While this insect is a bit more known to the general population than the others, it never ceases to amaze those that lay their eyes on it. According to studies, there are well over 3,000 species of these types of insects throughout the world. Many of them possess wings and have the ability to actually fly! Just how DOES an insect get that close to resembling a twig? It is not just weird, but, it is amazing, too!